Veteran filmmaker Subhash Ghai celebrated his 74th birthday on January 24. 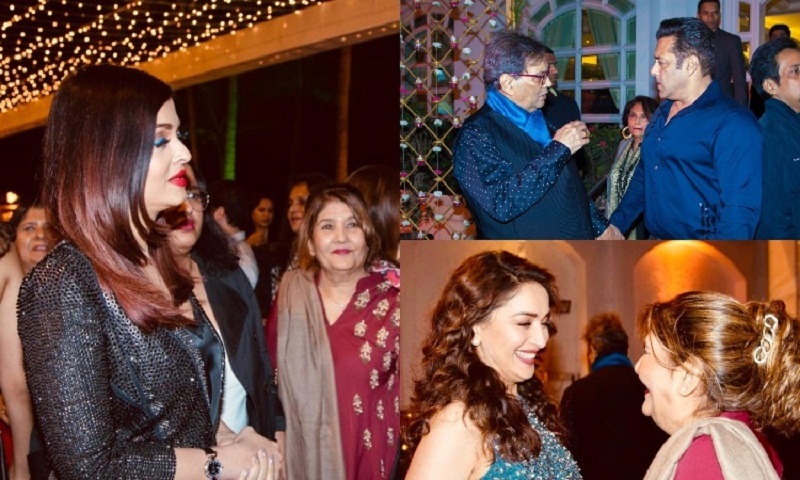 His daughter Meghna Ghai Puri threw a party for her dad, which saw a bevy of big names from Bollywood grace the function. Among the stars who were spotted at the do were Salman Khan, Aishwarya Rai Bachchan, Madhuri Dixit and Jackie Shroff. All the stars have worked with Ghai — Madhuri and Jackie Shroff (Ram Lakhan, Khalnayak), Aishwarya (Taal) and Salman (Yuvraaj). Also seen at the do were singers Sonu Nigam, Sukhvinder Singh and Alka Yagnik. Other guests included Neeta Lulla, Prahalad Kakkar, Sabbas Joseph, Manmohan Shetty, Pradeep Guha, Randhir Kapoor, Ramesh Taurani, Ronit Roy, Shreyas Talpade, Satish Kaushik, Alvira and Atul Agnihotri among many others. Ghai also runs a film acamedy in Mumbai called Whistling Woods International film and media institution. In the pictures that are online, we see Subhash meeting Madhuri, Aishwarya and Salman warmly. In his long career, Ghai has delivered huge box office hits such as Kalicharan (1976), Karz (1980), Hero (1983), Meri Jung (1985), Karma (1986), Ram Lakhan (1989), Saudagar (1991), Khalnayak (1993), Pardes (1997) and Taal (1999). His Iqbal won him a National Award in 2006, reports Hindustan Times.